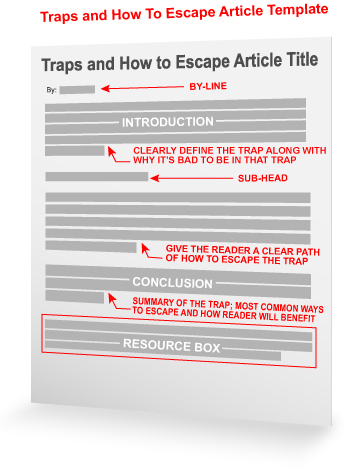 Here’s an article writing template idea for you to use: The “Traps & How To Escape Them” article template! We’ve all been trapped from time to time on almost every plane of possibility ranging from physically, mentally, emotionally, spiritually, financially, etc… and you get to save the day with your expertise by delivering the “escape plan” followed with a Resource Box where they can learn how to further escape from the trap. Make a list of every trap you know someone in your ideal target market has fallen into on purpose or by accident. Important: Only list (1) trap per article but you can list a single or multiple ways to escape it in each article. First paragraph clearly defines the “TRAP” along with why it’s bad to be in that type of trap. Example: Overtraining for your next triathlon event might be the trap and it’s bad because overtraining can lead to burnout and decreased performance. Optional: Stir the pain up by selling them on the ideas as to why being caught in the trap won’t help them achieve their goals. Optional: Sympathize with the reader as to why they are not alone and that many before them have fallen into this trap for the following 2-7 reasons. Next, setup a sub-head to clearly show them you are now going to help them “ESCAPE” from the trap they have found themselves into. Important: Make it extremely obvious where in your article the reader can quickly scan to grasp your escape route ideas. Don’t hide this from them deep inside your article body or mislead the reader to think they have to visit your website to find the escape plan. Give the reader a clear path from their current ‘locked up’ position of being in a trap to how to escape the trap via your unique ideas, strategies, tips, suggestions & secrets. Optional: After you’ve helped them to escape the trap, show them how to never get caught again in the trap. Conclude with a quick summary of the trap as you defined it; the most common ways to escape it and how the reader will benefit by following your advice. So, get started with step #1, brainstorming all of the different traps your ideal target reader may find themselves in as it relates to your niche and expertise. You’ll be amazed how fast the rest of this article will seemingly almost write itself once you do the hard part of identifying the most common traps & your specific advice for how to escape. 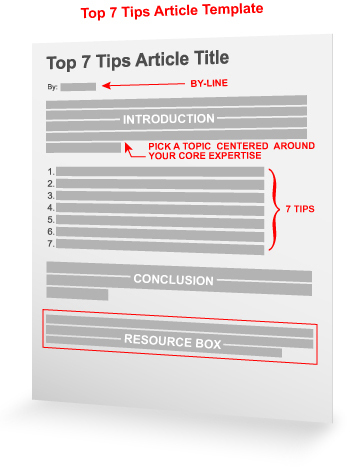 Step #1: Start with the Top 7 article template of writing an article with (7) tips, strategies or insights on any given topic centered around your core expertise. This is article #1 for you. 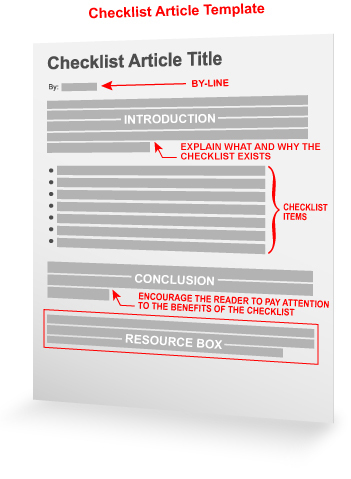 Step #2: Write an article expanding on each of the (7) tips you gave in the 1st article. This is article #2 through #8. Your Top 7 Tips article gives just the strategies, tips and facts …FAST and with little more than a sentence or two as to why the tips are important. The other (7) articles you write that expand on each of the tips goes more in-depth on each strategy telling why, how, who else has done it, and gives more examples for those who want to better understand. 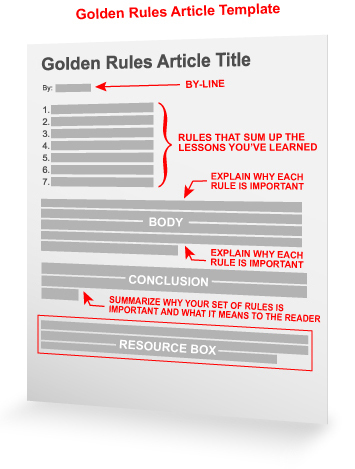 The “Golden Rules of X” article template idea is ridiculously simple, yet can be powerfully perceived as valuable by your readership. Using a numbered list, include the rules that sum up the primary lessons you’ve discovered or learned through your experience & expertise. Expand to include “WHY” each golden rule you’ve outlined is important. Summarize at the end the theme behind why your set of golden rules is important and what it will mean to the reader when they implement them in their own life and/or business. Broad vs. Narrow focus: You can include the golden rules of various aspects of your niche including narrow topics or sub-topics rather than only a broadly-focused set of golden rules. Most people will do more to avoid pain than they will to seek pleasure. Because this is true, you can use this psychological trigger as the basis for a series of articles that show how to avoid pain associated with various issues within your niche. Some say that pain avoidance is the #1 underlying force in most buying/purchase decisions. Everyone experiences PAIN in some form, whether it be physical, psychological, emotional, financial, etc… and articles that help people cope or eliminate pain deliver real value. I’m certain there is a higher volume of searchers/users/readers looking to avoid pain vs. those who search/read/surf for pleasure-seeking alone. Introduce the pain. No more than (1) paragraph. Give real-world solutions to the pain. (3-10) paragraphs max. Tell why the solutions offered solves the pain. (1-2) paragraphs max. 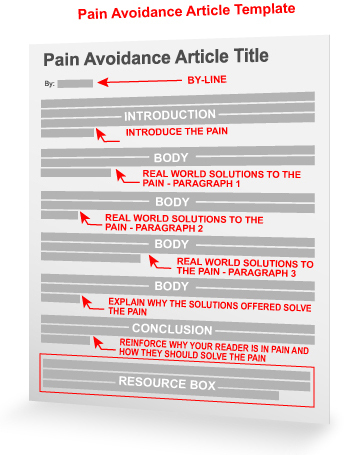 Wrap up with a (1) paragraph conclusion that reinforces why your reader is in pain, how you recommended they solve that pain and why it’s in their best interest to follow your advice. Searching for new article format ideas? 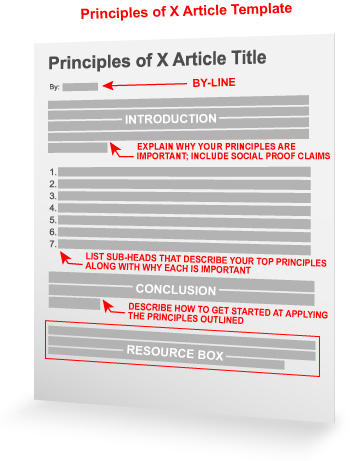 Look no further than what I call the “Principles of X” article template. An article title that lets them know they will be learning principles of something. Introductory paragraph that explains why your principles are important to the reader along with any social proof claims that can support your statements. A sub-head that describes your top principles along with why each principle is important. A closing paragraph that wraps up with either how to get started at applying the principles outlined or a helpful tip to help the reader overcome any objections they might have to understanding or applying one of your principles to their life or business. 9 Principles To Live By – To Be Mentally And Emotionally Strong! There may be no ‘right’ way to do this template as you can see that some give a number to their principles, some call them “The Principles” (as if there were no other principles on the matter), some call the “Basic” or “Universal” principles, but they all usually give a numbered list with sub-heads that make it easy for the eye to see and read the principles outlined. How can you apply this to your area of expertise? 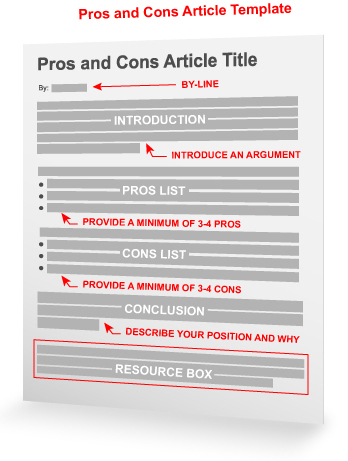 The “Pros and Cons” Article Template works like this: You introduce an argument with 1-2 paragraphs max and then you provide a minimum of 3-4 pro’s and 3-4 con’s, wrapped up by a conclusion paragraph that describes your position and why. Too often articles are written that debate the merits of the author’s position (nothing wrong with that) but they fail to provide counter-arguments that can actually improve the authors credibility for being able to see the big picture or at least acknowledge the counter-arguments that exist (even if they don’t agree with them). 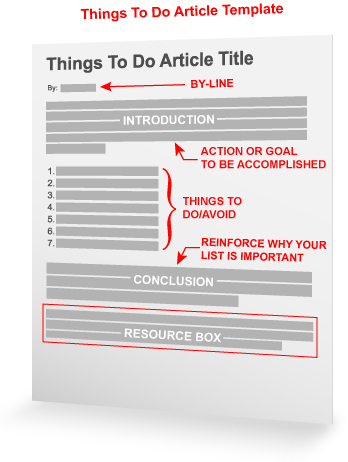 Tip: Use bullet points to present your list of Pro’s and Con’s as it’ll make your articles easier to read. Revised Tip: It’s “Pros & Cons” and not “Pro’s & Con’s”. 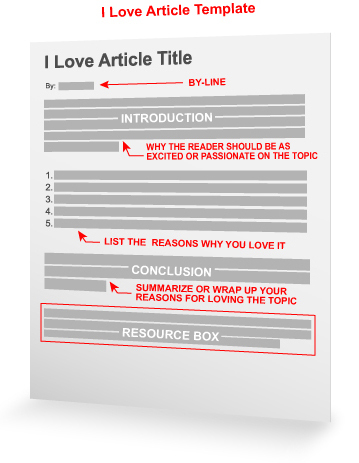 Here is a template you can use for your next set of articles…and I call it the “I Love Article Template” because it’s all about sharing something you love (or have a passion for) with others and telling them why you love it… and by doing so, you inspire the reader to connect with you or validate their own interests on the things or people they love.